The hexadecimal notation is almost universally used in computing – and not without a reason. There are sixteen hex digits – 0 to 9, and A to F (which correspond to decimal values 10 to 15), and each hex digit represents exactly four bits. Exactly two hex digits represent a byte, which can have a value from 00 to FF (that is from 0 to 255 decimal). In order to find a hex value of a multi-byte object, you would concatenate its bytes, for example, bytes 58 A4 1B FE constitute a four-byte value 58A41BFE (or FE1BA458 if the computer uses the reverse byte ordering). But why hexadecimal? Can't we just use good old decimal numbers? Well, they would be fine for a decimal computer, but most contemporary computers are binary and work on bits and bytes. A decimal digit represents approximately 3.3 bits, and this makes arithmetic too complicated. Let's assume we have two bytes with decimal values 243 and 78. What will be the value of the two-byte word? 24378? No, this method works with hexadecimal digits only. To find the decimal value of the word we must compute 243*256+78, which equals to 62286. Does not look very obvious, does it? Imagine finding a value of an eight-byte long variable and you will see why the decimal notation is not the best choice for binary computers. Do I really need to know this? Yes, you should have some understanding of hexadecimal notation; in fact, there is not much else to know. Hex byte is the only kind of object a computer handles, and hex bytes are used to represent anything. For example, a hex byte 50 may represent the capital letter P, the processor command "push eax", the decimal number 80, a color component with 31% brightness, or a zillion of other things. The obvious question is "How can I tell what does the byte represent?" Well, sometimes you can tell that easily, sometimes – not that easily, and in many cases you can't tell that at all. It is usually easy to recognize a character string, but in other cases you will have to guess. Fortunately, it is not as bad as it sounds, and you will quickly pick up a few tricks. But for now it is enough to understand that 1) any computer data is just an array of hex bytes, and 2) a hex editor is a program that shows the true contents of a file, and lets you edit the data you normally can't. You can see four distinct panes marked with different colors. The leftmost one is the Address pane; each number in the pane shows the address of the first byte of the corresponding line. The only exception is the line on which the input caret is - it shows the address of the current byte, not the first one. The addresses are shown as hexadecimal numbers but if you point the mouse cursor to an address, the decimal value will appear in the Quick View popup window. The next is the Hex pane, which displays the file contents as an array of hex bytes. The light green ANSI pane shows the file contents as characters, and the rightmost UNICODE pane shows two-byte UNICODE characters. Note that all three data panes show different representations of the same data. If you change data in any data pane, the other two will change accordingly. You can switch between the panes by pressing the Tab or Shift-Tab key, or just by pointing the mouse cursor and pressing the left mouse button. Hex numbers may be good for computers, but how can one convert a hex number to a more human-friendly decimal value? Easy! First, select the number either with your mouse, or by using the arrows key while holding down the Shift key. Second, move the mouse cursor to the selected area, and FlexHEX will display all the valid representations in the Quick View popup window. Sometimes there is no valid representation at all. For example, if you select five bytes, there will be no Quick View window because FlexHEX knows no object five bytes long. However any 1, 2, 4, 8, or 16 byte long field has at least one valid representation. In general, when the mouse cursor changes to the arrow-with-question-mark shape, this means that FlexHEX has something to show you and the Quick View window is ready to appear. Now press the Tab key to switch to the green ANSI pane and type in had a little lamb. 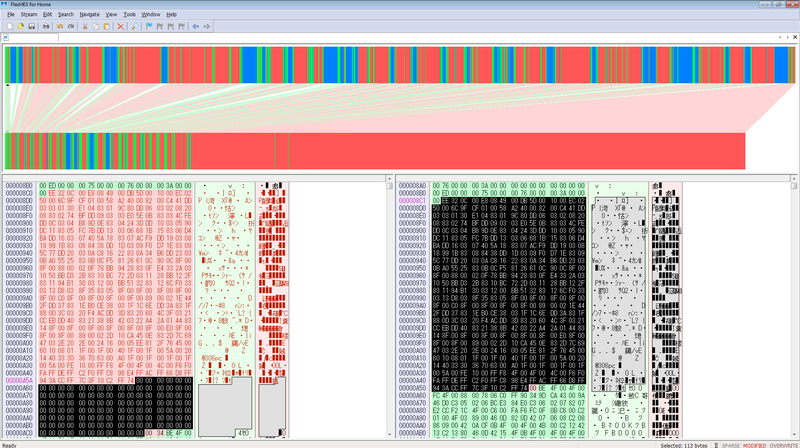 It is easy to see that every byte in the Hex pane corresponds to some character in the ANSI pane. When you enter a hex value, the corresponding character appears in the ANSI pane and vice versa. Don't be afraid to make a mistake – FlexHEX has unlimited Undo/Redo list. If you did something wrong, just press Ctrl-Z to undo the action. A simple but rather typical task is to go to some address and replace some bytes. As an example we will change the byte string EB 1F 5F FB to 01 00 00 00 at the address 52E1C. Don't forget to pay attention to the Dec/Hex selector. FlexHEX is smart enough to recognize a hexadecimal number if it contains hex digits A to F, but if the number consists of decimal digits only, make sure you have selected the correct number radix. We have found the data, but before typing in the new values check the Insertion Mode indicator in the status bar. If it displays OVERWRITE, the newly entered data will replace the data at the current position marked by the blinking input caret. The INSERT mode works differently. The existing data starting from the current position are shifted below, making place for the data you are entering. Note that this will change the position of all data objects below the insertion point. Many files get corrupted if their data have been shifted, so be careful and pay attention to the shift indicator in the status bar. If the current mode is INSERT, press the Insert key to switch to the OVERWRITE mode. This pane lists all modified areas in the file. Click the area starting or ending address to jump there; to select the whole area, click the size field. Select the appropriate representation and enter the new value. How to move every second byte (String character) one space to the left in a file? The current version 2.x can't do that. The next version will include a full-featured scripting engine. Hi, do you know how to remove bytes permanently? Ray, press the 'Ins' key on your keyboard to switch between the 'Insert' and the 'Overwrite' modes. In the 'Insert' mode the 'Del' key will actually delete bytes, shifting the data. Thanks, it works perfectly! I missed that part of the guide, my apologies.